The photograph above was taken at some time before 1902 when the property that is now 13 High Street in Thornbury was re-developed. Number 13 High Street is the smaller house on the left of the photo. It shows a group of people on the pavement outside of 13 High Street and the adjoining shop of Charles Olds (15 High Street). They were part of the annual parade of the Town’s poor people who had been given new shawls and coats by the Mayor. The photograph on the right below taken in 2008 showing the building as it was after the 1902 re-development. We haven’t seen the deeds of this property. Normally this means that we can only start our history from the time of the 1840 Tithe Survey when the property was owned by Thomas Jenkins. However in this case, we are fortunate that the buildings proximity to The Swan and the family links to Thomas Jenkins have enabled us to go back as far as 1667 when it was owned by William Ogborne. William Ogborne – we know that a draft indenture for the adjoining property dated 1750 refers to 13 High Street as being previously owned by William Ogborne. William is listed in the rent roll assumed to be dated about 1670. He was living two properties to the north of The Swan, thus confirming his connection to 13 High Street. The rent roll entry shows the property consisted of 3/4 of a burgage. The 1671 Hearth Tax record shows William’s house had 5 hearths which is more than most of the other properties in the Borough at that time which had two or three hearths. This probably indicates that the building was fairly large. William was listed in the account books of the Overseers of the Poor up to 1689. He was Mayor of Thornbury in 1676/77. William died around 1689 and his will was proved in 1690. The will was dated 2nd January 1689 and it shows William was a baker. He left ‘all that my messuage or tenement with the appurtenances situate in the High Street of the borough of Thornbury wherein I now dwell together with the garden and backside to the said messuage or tenement adjoining and belonging and one barn and one stable to the said garden also adjoining and being next to a street of the said borough commonly called St Mary Street als the Back St …………… unto my said wife Anne during the term of her natural life and immediately from and after the decease of my said wife I give devise and bequeathe all and singular the hereinbefore devised messuage tenement garden backside barn stable and premises with the appurtenances unto my sons Thomas Ogborn and Joseph Ogborn and to the survivor of them his heirs and assigns for ever‘. Ann Ogborne, presumably William’s widow, was listed in the Overseers Accounts in 1690 through to 1719. According to Caffells notes, William and Ann were married by 1647 and that they had an interest in an acre of land called Churchfield. The 1696 Tithe Terrier mentions other land which had been owned by William Ogborne, one called Drimble, then owed by Henry Bingham, and others called the Poole Moselands and the Coppice at Milbury Heath, then owned by Ann Ogborne. The will of Jane Wheeler dated 1629 mentioned on several internet sites raises the possibility that William Ogborne was the son of another William Ogborne and Jane’s daughter, Elizabeth (Wheeler). Jane leaves ten shillings to William whom she notes is the son of John Ogborne. She leaves her daughter Elizabeth Ogborne twelve pence and a share of her wearing apparel. In the will of Jane’s son, Giles Wheeler dated 1650 he leaves to his kinsman William Ogborne baker all the residue of his estate and makes him sole executor. It is interesting to note that the amount payable for the property was reduced from 10d per month that William and Ann were paying up to 1690 to 5d per month which Ann was paying from 1706 to 1719. We don’t know if this means that the property was possibly divided into two smaller units at that time. We note that the Overseers Accounts after 1719 refer to people paying ‘for Ogborns’. We have learnt that this can mean two things: either the Ogborn family continued owning the property and it was being let out to tenants or that the name of the previous owner was being used to describe the property. We are not sure which is the correct meaning in this case. We suspect that the Ogborns still owned the property as over the next seven years there were three other people listed there for short periods who are likely to have been tenants. Certainly there seems to have been another generation of William Ogborn as a William married Elizabeth Mansell on 24th December 1723. John Champneis – the Overseers Accounts show that John was accountable for the payments from 1720 to 1725. In the account records John is listed as paying ‘for Ogborns’. Note that the amount payable was reduced from 5d per month in 1721 to 2d per month in 1722 and thereafter. Inevitably John is likely to have been connected with the Champneis (often written as Champnneys or Champnies) family who owned the adjoining property at 15 High Street. We don’t know anything about John. Mary Robbins – the Overseers Accounts lists Mary Robbins as paying 2d per month in 1726. We believe that Mary Robbins was the widow of Richard Robbins who died in November 1726. In 1727 the accounts list ‘Mary Thurston’ as paying 2d per month, but ‘Mary Robbins’ is listed as paying the rates from 1728 to 1733. We think that Mary Thurston and Mary Robbins were one and the same person. It seems possible that the confusion in names arose from the fact that Mary Robbins was formerly the widowed Mary Thurston who married Richard Robbins in Frenchay in October 1723 . If this is the case, we believe that Mary was the daughter of Jonathan Hibbs and his wife Margaret nee Cox and was born in September 1695. Mary Hibbs (as she was then) married John Thurston on 5th January 1718/1719 at the Quaker Meeting House in Thornbury. John Thurston a baker, died in October 1720 and was buried in the Quaker churchyard in Thornbury. The widow Mary Thurston then married Richard Robbins. We are grateful to Richard Barton for untangling this complicated marital history and bringing it to our attention. William Greenwood and Mary (formerly Robbins) – in 1728 to 1733 the Overseers Accounts show Mary Robbins liable for paying rates ‘for Ogbornes’. Mary ‘Robins’, a widow, married William Greenwood in St Michael’s Church, Bristol on 29th July 1735. Thereafter William was shown as the person paying the rates. It seems likely that this was Mary’s third marriage and that she was the Mary Robbins and Mary Thurston named above. Thomas and Hannah Jenkins – Hannah was born on 7th October 1801 at Sibland and baptised at Thornbury on 10th January 1802. She was the daughter of William Greenwood and his wife, Ann (nee Thomas). Hannah married Thomas Jenkins of Hackett Farm, Thornbury and had children. Thomas and Hannah had at least three children: Ann Jenkins baptised on 2nd January 1822 when the family home was in Sibland, William Jenkins baptised on 23rd March 1823 and Mary Greenwood Jenkins baptised on 27th May 1827. The baptism records show Thomas was a farmer and the family were living at Morton when the last two children were baptised. In 1841 Thomas and Hannah Jenkins were living at Rockhampton. Thomas Jenkins was described as a forty-four-year-old farmer, Hannah was aged forty, and their children included Ann aged twenty years, William aged fifteen years and Mary aged fourteen years. Living with them was William Greenwood, independent, and aged eleven years together with four servants. Little William was the son of Hannah’s brother, William and his wife, Hannah who were farmers at Whitfield. In 1851 Thomas and Hannah were farming at Rockhampton. Thomas was described as a fifty-three-year-old freehold farmer with 100 acres and employing two men. He was born in Thornbury. His wife Hannah was aged fifty and born in Thornbury. Their child William, aged twenty-eight-years, was at home and born in Thornbury; William Greenwood their twenty-one-year-old nephew, who was born in Thornbury was staying with them and there were four servants. In 1861 Thomas Jenkins, a sixty-four-year-old maltster, was living at Hacket Lane, Thornbury with his fifty-nine-year-old wife Hannah. Both were born in Thornbury. Living with them were Daniel Savery and Mary Ann Liddiatt who were both servants. Thomas died on 20th December 1870 aged 73. In 1871 we find the family at Hackett Farm, Kington. Hannah Jenkins was head of a household next to the farmhouse where she lived with two grandchildren and staff. She was described as a sixty-nine-year-old widow born at Sibland. Her grandchildren included John Ford aged nineteen years, a farmer and maltster, born in Rockhampton and Hannah Ford aged twelve years, a scholar, born in Rockhampton. Living with them were Mary King, the housekeeper and Lucy Stanley a domestic servant. Next door at the farm were William Jenkins, her son, and his family. In 1881 Hannah Jenkins was farming two acres at Hackett Farm with one man. She was described as a seventy-nine-year-old widow and farmer, born in Thornbury. Also in residence was her grand daughter Annie Ford, the twenty-year-old housekeeper, born in Rockhampton. With them was Annie Gough a thirteen-year-old servant. Her son William was farming next door with his family. Hannah continued to own the property at 13 High Street and the Malthouse in St Mary Street, both let out to tenants. Hannah died on 9th February 1886 aged 84. The property at 13 High Street together with the Malthouse and 2 St Mary Street descended to her grand-daughter, Ann Ford. Ann Ford – the 1887 Rate Book shows Ann as the owner of 13 High Street and the Malthouse in St Mary Street and the adjoining house, 2 St Mary Street. Ann was the daughter of the previous owners of the property, Thomas and Hannah Jenkins (see above). Ann married Joseph Ford at Rockhampton Church on 28th April 1842. The 1851, 1861 and 1871 censuses show Joseph and Ann at Over Court Farm in Almondsbury. They didn’t seem to have any children of their own, but usually had nephews and nieces living them. The 1881 census shows that they had moved back to Crossways, Thornbury. Joseph died aged 70 and was buried on 2nd June 1883. Ann Ford died at Crossways House aged 75 and she was buried on 1st May 1897. Following her death, her property was put up for sale at auction on 7th July 1897. There were three lots, a shop at 13 High Street occupied by Charles Symes, the house and shop which later became 2 St Mary Street and the adjoining Malthouse. The property was bought by John Hodges Williams. Thomas Ricketts – the 1840 Tithe Survey shows Thomas occupying Plot 193, a house and garden as a tenant of Thomas Jenkins. The 1841 census shows Thomas Ricketts was a cooper aged 25 living with his wife, Phoebe also 25. They were living there with Eliza Cornock aged 7 and Henry Watts, a cooper’s apprentice aged 13. Thomas married Phoebe Elizabeth Knapp at St Pauls Church, Bristol on 19th March 1836. Phoebe Elizabeth was baptised on 28th September 1814 and was the daughter of William Knapp and Elizabeth nee Pitcher. Thomas was a trustee of the British School and a cooper. He appeared in the Trade Directories between 1842 and 1877. Thomas and Phoebe had lived at 13 High Street since the time of the the 1840 Tithe Survey. The 1851 census shows Thomas was a cooper aged 40 from Rockhampton. Phoebe was aged 36 born in Thornbury. In the 1861 and 1871 censuses show Thomas and Phoebe carried on living at 13 High Street. The couple were living there with Phoebe’s mother, Elizabeth Knapp and her niece Hannah Hodges. Thomas died on 8th March 1876. The 1881 census shows Phoebe Ricketts as a shopkeeper at 13 High Street still living with Hannah Hodges. The rate books confirm that she was still renting the High Street property. Charles Symes – the 1885 Rate Book shows Charles was renting the property from Hannah Jenkins. Charles traded as a cooper. By 1887 Charles’s landlord had become Ann Ford. Charles and his family were to remain the property until about 1898 when he bought The Georgian House on The Plain. It was the local building firm of Tucker Brothers who were responsible for the re-development of the building. 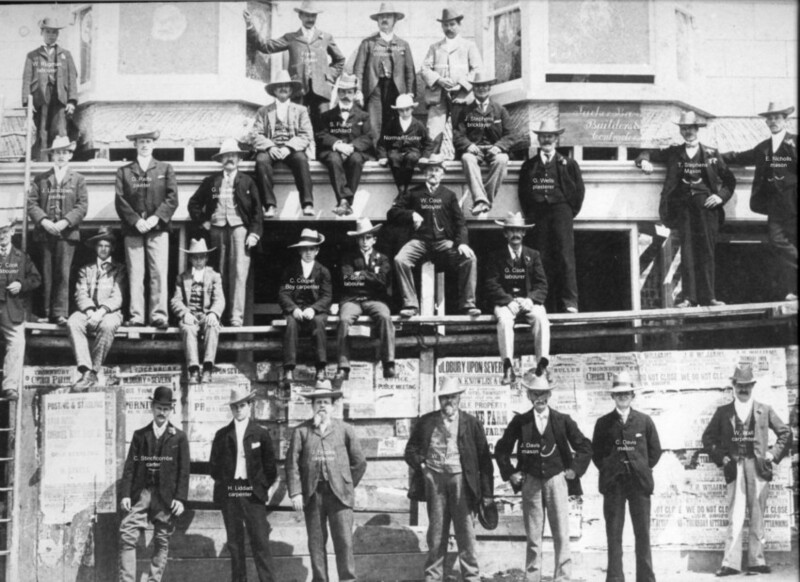 We are fortunate to have a copy of a photograph taken showing the members of the Tucker Brothers workforce standing on the scaffolding outside the shop. The men appear to have made a special effort to dress in smart clothes, rather than their building wear and most of them seem to have acquired fancy hats which makes them look like cowboys! Click on the thumbnail to see a larger image of this photo. James Spencer Palmer – James was a chemist and dentist. His shop and home were initially located at 1 The Plain which he was renting from John Hodges Williams. In 1902 James moved to the new larger shop which John Hodges Williams had had built at 13 High Street. James stayed here until his death in 1923 and we understand his wife, Amy, carried on for a few more years before moving away. The 1911 census shows the house was called Coronation House and had 8 rooms. These were occupied by James Spencer Palmer a qualified chemist and dentist aged 58 born at the Lizard in Cornwall and his wife, Amy Palmer aged 48 born in Charfield and their four children: Arthur Hugh Spencer Palmer a student dentist aged 22 born in Bristol, Nina Irene Spencer Palmer aged 16 and Robert Lewis Spencer Palmer aged 13 and Florence Margaret Spencer Palmer aged 10, all three born in Thornbury. They had one servant, Elsie Summers aged 13 born in Grovesend. Frederick Ellis – the electoral registers of 1931, 1935 and 1938 show that Frederick Ellis and Lilian Maude Ellis were living in the property. A newspaper report in 1929 indicates that by that time Frederick Ellis was already a chemist in the High Street. It seems that Frederick was fined for being drunk in the street one night. We also know from the 1936 trade directory that Frederick was a chemist and pharmacist and that he had taken over from ‘late Palmer’. He appears in the 1939 trade directory, but by 1946 they had moved away from Thornbury. The Western Daily Press of 8th January 1932 reported that Ivy Ellis of Coronation House in Thornbury had been reported for driving in Bristol without due care and attention. The Ruggs – ‘Bernard W. Rugg’ ran a chemist shop at Coronation House from about 1939 to 1958. He advertised in the programme of the Thornbury Flower Show for 1961. The advertisement described him as “M.P.S” and said he was a pharmacist and optician. We also know from newspapers of the time that in 1949 his son John Reginald Rugg of Coronation House qualified as a chemist. Walter Bernard Rugg was born in Croyden on 3rd October 1898. He was the son of Walter James Rugg, a chemist and his wife, Flora A. Walter married Minnie Evelyn Winstone Cole in the Cheltenham area in 1923. Minnie was born on 20th December 1895 in Skenfrith in Monmouthshire. They had three children: Reginald John born in the Barnet area in 1925, Patrick James born on 15th April 1928 at Borehamwood, Herts and Margaret E born in Barnet area in 1930. The 1926 and 1929 Trade Directories show that Bernard had a chemist shop at Station Parade in Boreham Wood. The special register compiled in 1939 in preparation for the war shows Walter and Minnie living in Coronation House with Walter’s father, Walter James, a retired chemist born on 16th August 1867 and his new wife, Jessie E. born on 8th January 1869. Walter’s son, Patrick was also living there and three other names were blacked out so the details are unreadable. Peter L Rugg, who we assume to be Walter’s nephew was also listed in the property. Peter was born in the Watford area on 2nd March 1929, the son of George W. Rugg and his wife, Beatrice (nee Tydeman). We are not sure when they moved away from Thornbury. They were there in the 1958 electoral register. Bernard died in Yeovil on 15th June 1961. He was aged 60. Minnie died in Cheltenham in 1981 aged 85. The Goodes – the 1961 and 1965 electoral registers show George L Goode and his wife, Beatrice M (nee Thomas) were living at Coronation House with their son, Michael E.
George had married Beatrice in Birmingham area in 1940. They had moved from Moreton in the Marsh to Thornbury with their three sons in 1958. George rented out Coronation House at 13 High Street and ran optician’s business for about 12 years. A programme for Thornbury Flower Show in 1962 shows that George was trading there as an optician and that Hodder’s traded there as a pharmacy at the same time. When he retired in the 1970’s they moved to 62 High Street which they rented off the Williams family estate. Beatrice who had been helping out in the chemist shop took over the tiny antique shop called Dovetail Antiques in Chapel Street which her son, David had started up. Since the 1970, the shop continued to be occupied by chemists, Hodders and then Westons. Then we believe an opticians, Dury and Shaw were there for a few years, followed by Manns, the opticians before the PDSA made it into one of their charity shops.